Many owners have found yacht refit to be a protracted process and in some cases have missed more than one season of sailing. This seems to be particularly the case when owners carry out the bulk of the work themselves. We were wary of this when refitting Zest, my partner Kass’s custom-built design by Rob Humphreys, in the spring of 2013. 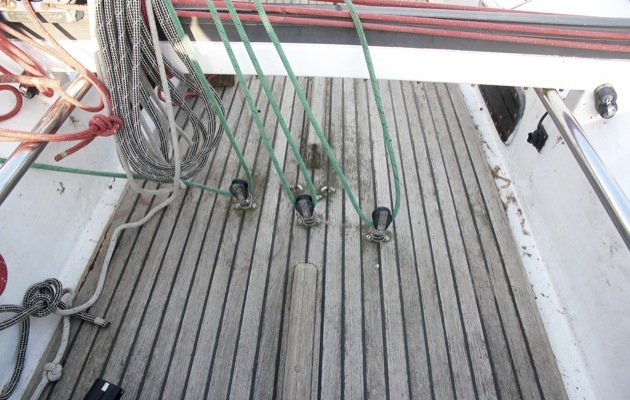 The boat had already had a considerable amount of work done in her previous ownership, including a replacement teak deck and new mast, boom and standing rigging. Much of the running rigging had also been replaced and there was an almost unused offshore specification double taffeta laminate mainsail. 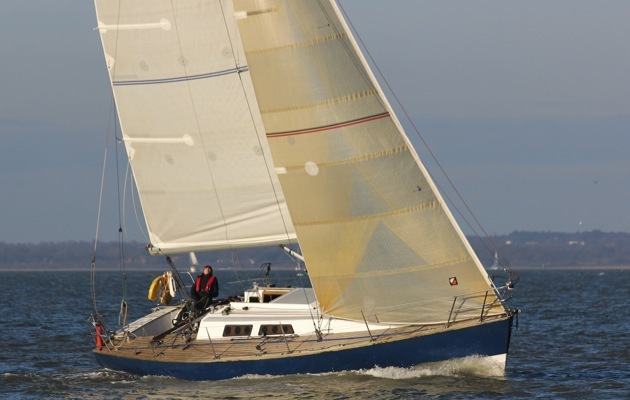 However, a refit was still needed to update other ageing systems and prepare Zest for her intended purpose of short-handed, long-distance racing and cruising. One of the overriding priorities we established at the outset was the need for reliability. Oversized gear was, therefore, fitted wherever possible and we did our best to plan for redundancy of systems. An important part of planning the refit was to sail the boat for six weeks to gain a clear picture of exactly what needed to be done and to plan the schedule of work. As ever, the refit still didn’t progress entirely smoothly. A worrying, but easily resolved, concern was that the keel bolts were one size smaller than those specified in the plans. 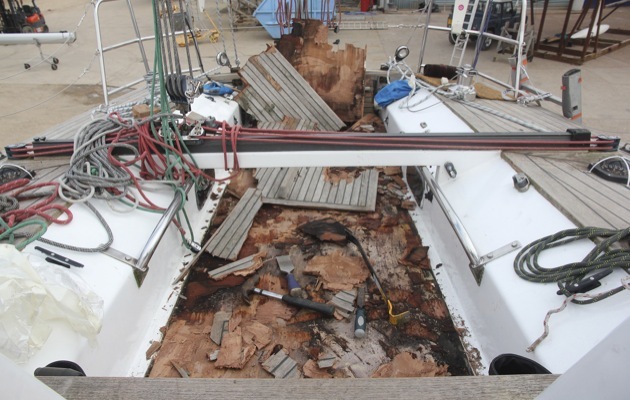 A nailbiting few hours followed this discovery, until Hamble-based structural engineer Richard Oliver ran the calculations, which showed that the bolts fitted were still several times larger than those needed to meet accepted minimum safety margins. A bigger unexpected problem was with the teak cockpit floor, which had not been replaced with the rest of the deck. To speed up the refit we had hoped to delay renewing it by at least one season, which seemed like a viable plan, given low moisture meter readings on the plywood subdeck. However, the spring of 2013 was exceptionally dry and when it finally rained the meter readings spiked upwards well into the red zone. Given that this was the busiest time of year for anyone working on boats, it was all but impossible to get a boatbuilder to commit to doing the work within a viable time-scale. We therefore pitched straight into doing the job ourselves, including replacing some of the structural ply deck underneath the teak. This delayed completion of the refit by two to three weeks, but our quick decision here minimised the delay to the programme. With the benefit of hindsight, would we do a similar project again? No, at least not for a long time. But are we glad we did it? Absolutely. Some suppliers were exemplary in the service they offered. OneSails, for instance, went out of their way to ensure the new sails were delivered to a tight schedule and found time to sail on Zest to check that they set as they should. Similarly, Medina Yard in Cowes and Paul Dunstan of marine engineering company Seatek were also extremely helpful, even though both were already very busy. However, the most frustrating aspect of the project was with a small number of suppliers that were not able to meet anything resembling promised delivery dates. Some of these shipped part orders at apparently random times, occasionally without documentation, which made figuring out exactly what you had received, and what was missing, frustratingly time-consuming. In the 16 months following the refit Zest has covered more than 9,000 miles, from the Azores to Shetland, around half that distance being racing. Failures to date have been very minor: the masthead wind sensor, which was replaced under warranty, a broken spinnaker halyard and failed splice on the main halyard. Beyond routine maintenance and attending to cosmetics that were skipped for reasons of time and budget, as yet there’s no evidence of Zest needing another refit for many years to come. With the benefit of hindsight, would we do a similar project again? No, at least not for a long time. But are we glad we did it? Absolutely. The three-month refit resulted in a boat that is optimised to our requirements and has quality new systems that help to make Zest even more of a joy to sail – the rewards of the effort and expense are recouped every time we sail her. We also have the benefit of knowing every inch of the boat.